So I was rather miffed when I was searching online for fun places to take photos (i.e. 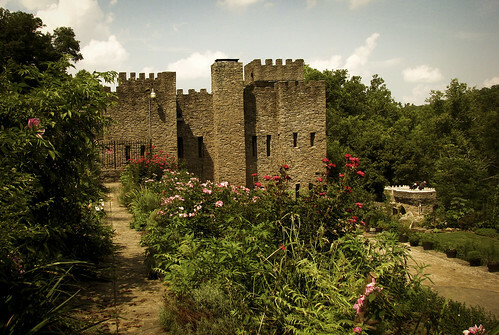 castles), when I found out that for 4 1/2 years, I lived less than two hours away from one. !!! I’m still a bit miffed, to be honest. Sarah, you should go visit. You’d love it. 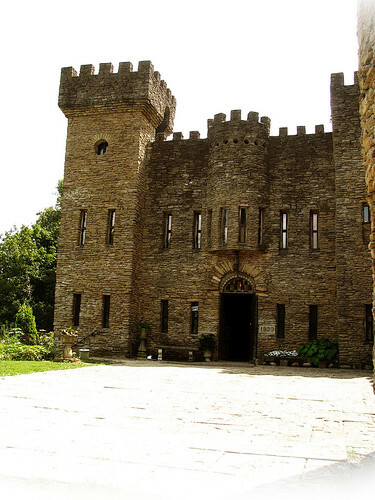 Built by an architect from local limestone (and a few rocks from all over the country that people would bring him), the castle looks pretty legit. Twisty staircases, a tiny dungeon, and whole lot of old pictures make for a interesting afternoon. Preferably on a cooler day than when I visited. It’s pretty affordable too–only a few dollars for admission. If you’re in the Cincinnati area, it’s definitely worth a look. Walking up from the parking lot. The castle is in the middle of a neighborhood. 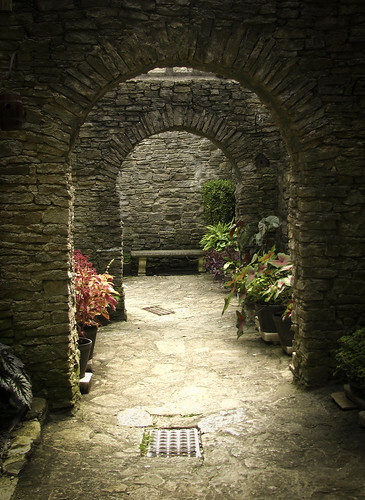 This arched path takes you from the front courtyard to the back gardens. You can also walk around the building to the fancy front door with the name on the top. Here’s the back view from the terraced gardens. To the right is the road (past the fancy gate (Bellatrix and Neville are fighting on top) and on the other side of the road is a little river, where the builder got his limestone, apparently. Now that I’ve done the post, I may add a few more pics, and possibly a few more facts. We’ll see. Also – WHEN WERE YOU HERE?!? …..um. July. I’m a lame friend, i know. Drove to Michigan for Tori and Grant’s wedding, stopped ta the castle and came home.